Gareth Wright produced a sensational performance to storm four shots clear of the field at the halfway stage in the £30,000 Aberdeen Asset Management Scottish Open qualifier at Kilmarnock (Barassie). The West Linton PGA pro, who is bidding to pass this test for the third year running, equalled the course record at the Ayrshire venue with a nine-under-par 64, which contained two eagles and seven birdies. His stunning effort toppled European Tour player Scott Henry from first place after he’d posted the clubhouse target earlier in the day with a 68 as 132 players battle it out for four places in the £5.5 million main event at neighbouring Dundonald Links. Jack Doherty, last year’s winner, and amateur Craig Ross are the other two players on course to join the likes of Rory McIlroy, Henrik Stenson, Adam Scott and Rickie Fowler in the Rolex Series event, starting on Thursday. Wright, a member of the first Great Britain and Ireland team to win the PGA Cup on US soil two years ago, made his eagles at the eighth and 12th, chipping in for the first one before hitting a 4-iron for 15 feet for the next one. “It could have been 12 or 13-under as I had two lip outs and two or three more that came within half a roll of dropping,” said the Edinburgh-based Welshman after earning a share of the pro record with Chris Doak and Austrian Markus Brier. 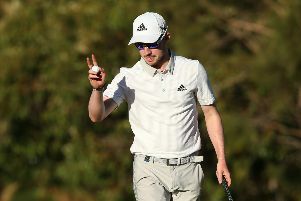 Henry, the highest-ranked player in the field, overcame a lost ball to card his 68 on a cracking day on the Ayrshire coast, where there was just enough of a breeze to create a test, even though Wright may have made it look ridiculously easy. After opening with a birdie, the Clydebank man also picked up shots at the fifth and sixth before having a “bit of wobble” on the eighth tee, leading to his only bogey of the round. “My eyes started watering – it was maybe the wind – and I just lost focus and put a bad swing on it and sliced it,” he said. “I lost my ball but made birdie with my second ball to limit the damage to a bogey-6, which I was pretty happy to walk off with after that. Doherty, who lives in Kilmarnock, signed for five birdies, while Ross, winner of a PGA EuroPro Tour event at Mar Hall in 2014, had seven on his card. Four players - Greig Hutchon, Ross Cameron, Neil Fenwick and Jamie Savage - share fifth spot with another seven, including Doak, a further shot back heading into the final round.